See this link for all latest updates. Copy and Paste structures and mobs to/from text files, with optional randomisations and autogeneration options. Support for Ruins Templates and also MCEdit Schematics, as well as the native Blueprint language. Larger Blueprint library coming slowly. The mod adds a new item -- a Wand -- and a few commands ( /wand, /blueprint ). It allows the person holding the wand to create any of a number of predefined structures (plans) at the click of a right-button; it also allows them to save an existing structure as a file (blueprint) that can be loaded back in as a plan and used again multiple times. 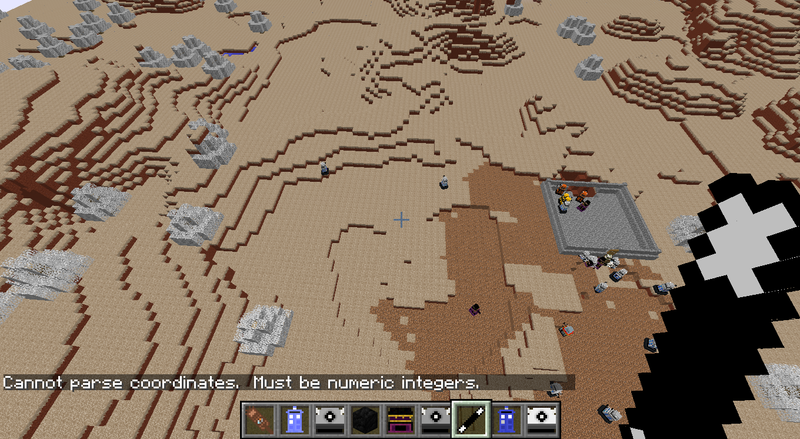 In Version 1.0, it is possible to set certain plans to auto-generate in new chunks as the world builds. In version 2.0, there are SPAWNER and CHEST directives to allow randomly generated spawner targets and chest contents. You can also specify NBT for metadata, chests, spawners, mobs or items as either raw JSON or as an external .nbt file. In version 2.2, there is the MOB directive to allow mobile entity creation. Also, MetaBlocks can be specified, which resolve to a different type of block depending on the current biome and randomness. 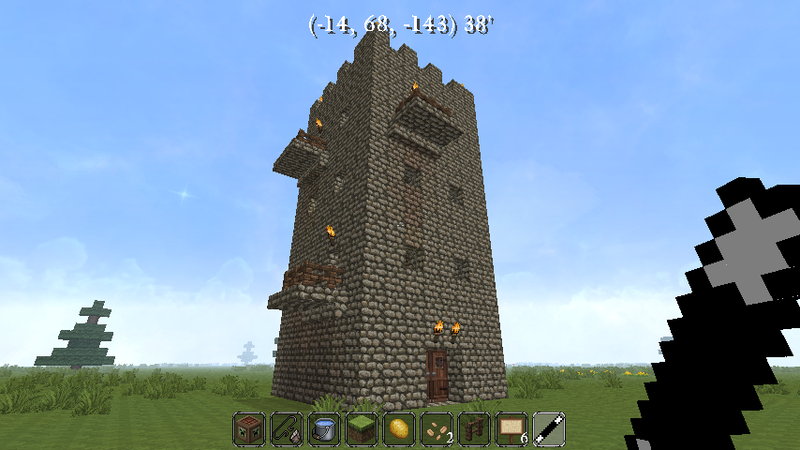 For example, the cottage will be generated using different stone and wood if built in the desert as opposed to being built in the plains, and the Tower can have some randomly-chosen cobblestone blocks mossy. In version 2.3.2, we get the MSG and PICTURE directives. PICTURE allows you to create a map-in-a-frame entity on a wall from an external image file -- so you can put your picture on the wall! In version 2.4, you can now copy a structure by using the command '/wand copy', and then right-clicking with the wand to indicate which area to copy. There is also support for structures defined as Ruins Templates, from the Ruins mod. These are converted into Blueprints when they are loaded. Version 2.5 adds Schematics support, and also an Undo buffer so that you can use '/bp undo' to back out your last change. The main thing to note is that, once the structures have been built, the mod is not required for the world to work (provided you have removed the Wand from the player inventory of course), though you do need to keep the mod installed for autogeneration to happen, of course. 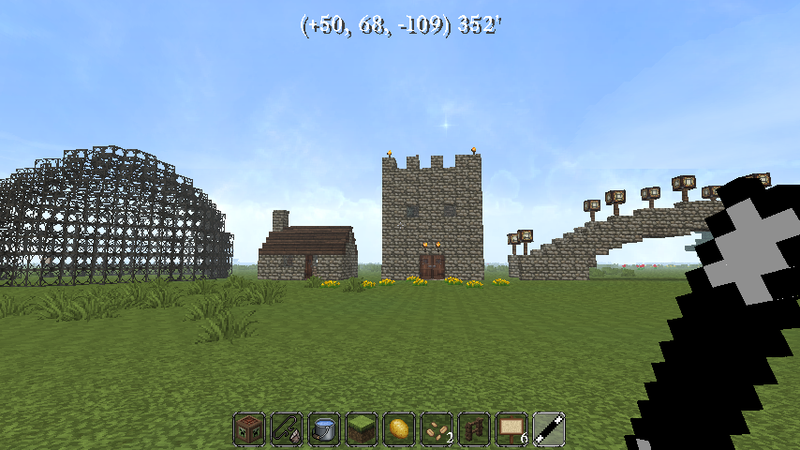 Note: This is my first Minecraft Forge mod. All constructive criticism and suggestions welcomed. Awesome, Finally A Mod Of This Type That Works With Other Mods And Also That Uses The Worldgen Option. This Is A Really Good Mod For Be Just A First Mod. Another Prove That A First Mod Shouldn't Be Just A Crappy Mod. Thanks for the support. I've been creating a lot of things for the kids worlds here, and really needed somthing like this... I couldn't find one online anywhere, so I learnt Java and wrote it over the last 2 weeks of summer holiday (I live in New Zealand, so it's summer for us). I've also contributed to the MCDungeon project (add procedurally generated dungeons to your world, really worth a look!) and wanted some way to do something similar in-game, hence the support for randomising in the Blueprint language. Version 1.0 is in pre-release form! This only supports Minecraft 1.7.10 currently, but 1.8 is coming. Version 1.0 is now released, with full support for Minecraft 1.7.10 and 1.8. Version 1.2 will have a re-written blueprint handling library that can be reused by other modules if they wish. There should also be some support for copying mobile entities. Version 2.0 is now released in Beta form, for Minecraft 1.8 only. This includes the new SPAWNER and CHEST directives for blueprints with randomly generated contents; support for external .nbt files to specify metadata for blocks, including chests, spawners, items and mobs; and a fix for an issue that would cause container objects to often be rendered with an empty inventory. This includes the source code; the 2.0 increment is because of the new blueprint directives, and also the rewriting of the blueprint functions and objects into a properly self-contained and portable package.Still no support for copying and placing entities, though. There is now much more abstractisation in the code for v1.7/v1.8 portability, and the Blueprint package is functionally separate. This now has the CHEST and SPAWNER directives, to more easily define these with randomisable contents; there is also the MOB directive to add mobile entities (which includes minecarts and armour stands) -- this also works with the /bp copy command, so you can copy entities and paste them. This adds the IFBIOME and IFBLOCK test directives to allow more control, and fixes some issues in 2.2. How do you select which blocks to save? I can't seem to understand it... Can you explain to me how to use the wand and blueprints? Use F3 to display the current coordinates. Identify the in-game block coordinates of the corners of the volume you wish to copy. Use the command: /bp copy myname x1 y1 z1 x2 y2 z2 Replace myname with the name you want to store the new blueprint under. The coordinates are for opposite corners of the box to copy; so "1 2 3 4 5 6" will copy from block 1,2,3 to block 4,5,6 (a 3x3x3 cube). It will not copy Air blocks. You can now use /wand set myname to make the wand produce your newly copied blocks when you right-click at a location. Use /bp savemyname to save your new blueprint to disk as confg/bp/myname.cfg . This will make it persist after game restarts. Note that the 'origin' as defined by a /bp copy may not be precisely where you want it to be. In this case, you can edit the new blueprint file to wrap the new plan in another plan that simply does an offset and/or rotation. See the cottage.cfg example blueprint for a demonstration of this. The wand is initially not set to do anything. You need to "enchant" it (I.E., associate it with an existing plan). Use /bp list to list the Public plans. Use /wand set name to set the wand to produce a specific plan. This works with public or private plans. A plan can be linked to a wand, so that using the wand will execute that plan. Blueprint files (containing a single plan) can be created by the /bp save command, usually after running /bp copy to copy something in-world. However, it is usually more efficient to write or edit them by hand. Version 2.4 soon to be released. This will allow you to select the area to copy using right-click on the wand, rather than having to type in the coordinates. It also adds support for Ruins Templates (from the Ruins mod); these are automatically converted to Blueprint format and made available. You can select the area to copy using right-click on the wand, rather than having to type in the coordinates. Version 2.5 is now available. This adds Schematics support, and the Undo buffer, as well as Flattenning of target area and various bugfixes. "Cannot parse coordinates. Must be numeric integers"
For some reason this won't work for me on my forge. Using version 1.7.10 and downloading v2.5 of this mod. All other mods work for me but this one will not load. Any help please? So when you open up the F3 menu it gives you your literal coordinates and at the very bottom of the menu it gives the coordinates of the block you're looking at, you have to enter the coordinates of the blocks you're looking at so there shouldn't be any decimal points, they're just going to be whole numbers. Like I said, I don't know if you figured it out yourself, but in case you're still stuck, try that because that's what I did and it worked for me. Hello, I've run into a problem with this mod and loading blueprints. Blueprints created with the wand tool eventually expire and I get a "build failed" error message when I attempt to load any of them. According to the log, there was no valid definition in block directive, and the step that failed was [# BLOCK undefined. Any ideas for a fix or way of avoiding this problem? WOOHOO!! I can finally make my cavalry fort in less than a month! 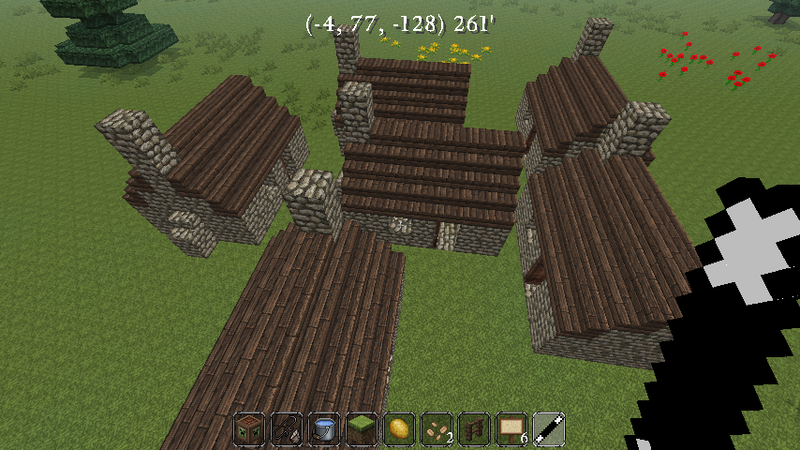 The time consuming part after building the stalls was building the connected feed rooms with the houses above as the defending wall. Of course by the time I get the first few stalls started, the horses have moved away. (CENSORED! )This is definitely going into my personal mod pack.